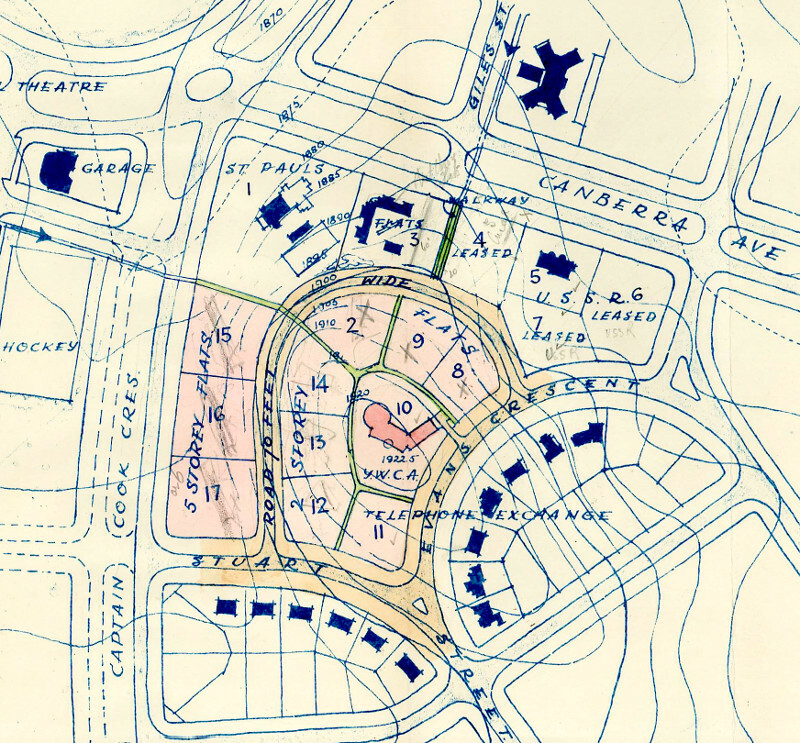 It is easy to underestimate the role town planners have played in all aspects of Canberra's development. 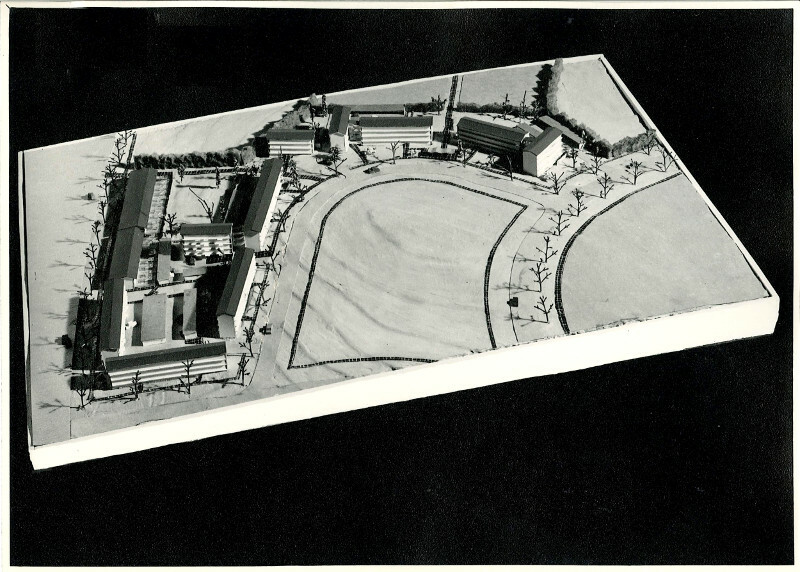 In addition to providing functional public housing, planners took into consideration the overall look of a housing development and its integration with the surrounding area. Views to and from housing developments were as important as the facilities provided. ArchivesACT recently discovered the unregistered file Department of Works - Group of Flats Section 39 Griffith. 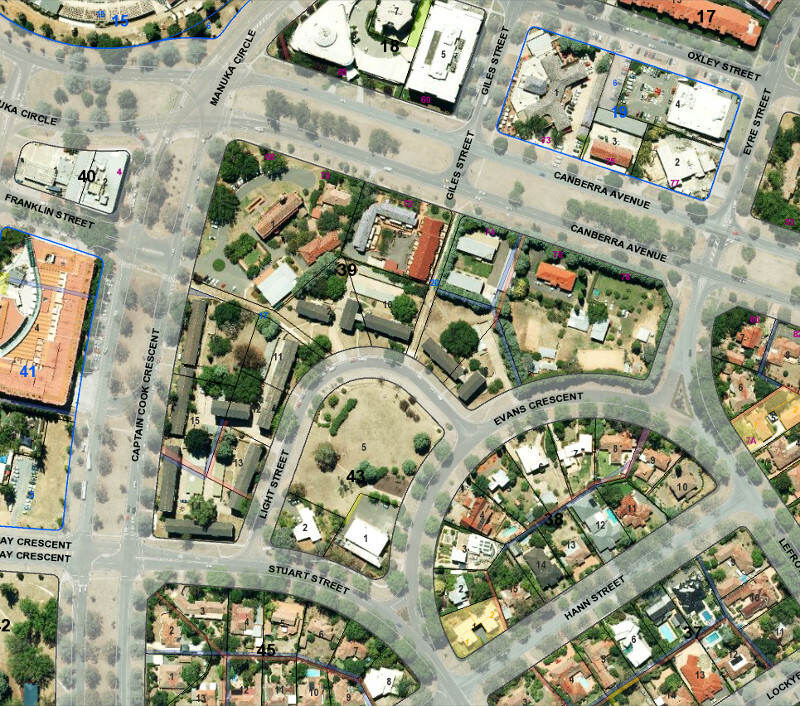 This file contains a report on the design and planning of Stuart Flats opposite Manuka. It also holds a collection of beautiful coloured sketches of the proposed housing development. A second file, PC35/16/7 - National Capital Planning and Development Committee - Section 39 Flats Griffith, documents numerous proposed plans for the site during the twenty-year lead up to construction of Stuart Flats in 1959-1960. These two files on Stuart Flats are ArchivesACT Find of the Month. Towards the end of 1939, the Department of the Interior proposed the "allocation of certain Blocks in Section 39, Griffith, as sites for boarding houses." The National Capital Development and Planning Committee (NCDPC) recommended new buildings in this section use "materials similar in character and colour to those used in the construction of the flats already erected on Block 3." The flats on Section 39 Block 3, that front Canberra Avenue, are called the 'Sutherland Complex' after the architect Heather Sutherland. The NCPDC had recently made recommendations for the use of light coloured bricks for larger buildings in certain sections of Canberra the city instead of the commonly used Canberra "red brick". The NCDPC viewed the use of light coloured bricks as a way to "save the added cost of maintenance of a rendered or painted wall." "It is desired to point out that the use of light coloured bricks is becoming more widespread for buildings of all classes throughout the Commonwealth, and it is specially desirable at Canberra where the value of lighter contrast with the somewhat dark nature of the terrain is of importance." bedrooms which form part of living rooms; and the elevations of the proposed buildings they thought were out of character with those of existing buildings in the same section, believing they required considerable revision and simplification. Despite this initial feedback to Oliphant's preliminary designs, these plans do not appear to have progressed any further. Early in 1941, the NCPDC considered new plans submitted by architects Rupert V. Minnett and Cullis-Hill as being "generally acceptable." However, they did not give "final consideration" to the plans "in view of the fact that the treatment of the site from the point of view of its unusual levels was not fully indicated." The submitted plans indicate a level site where in reality Griffith Section 39 is located on the slopes of a small hill. 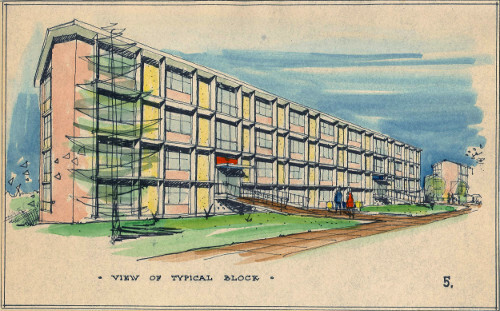 1941 plan of proposed flats on Block 11 Section 39 Griffith. Click on plan for larger view. A Look-Out Park or YWCA? 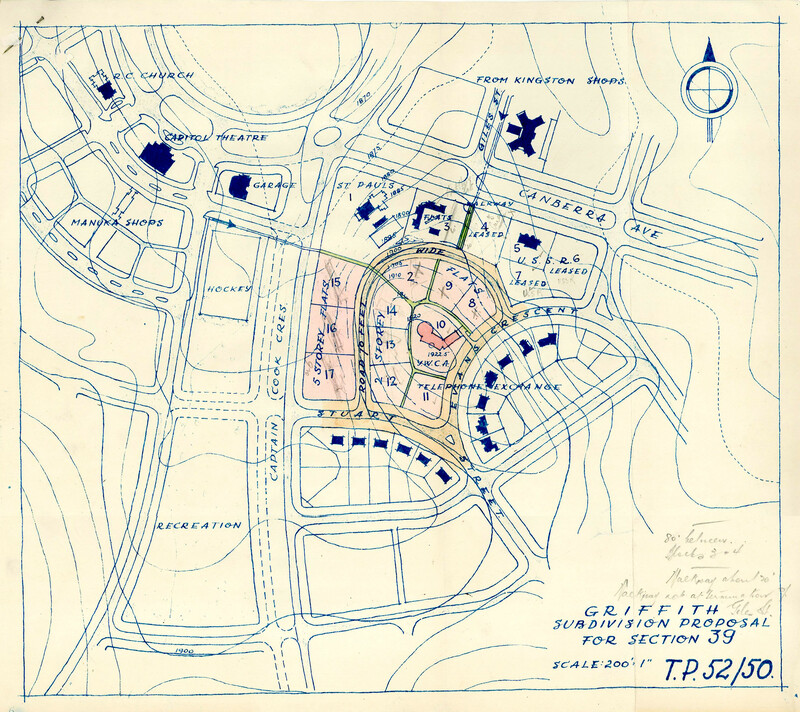 With most development in Canberra on hold due to the World War II, it was not until December 1950 that the Minister for the Interior, Eric Harrison, approved the street design TP52/50 around Griffith Section 39. His approval also covered a proposed YWCA and an automated Telephone Exchange. Extract from the 1950 map TP52/50. Click on map for larger view. 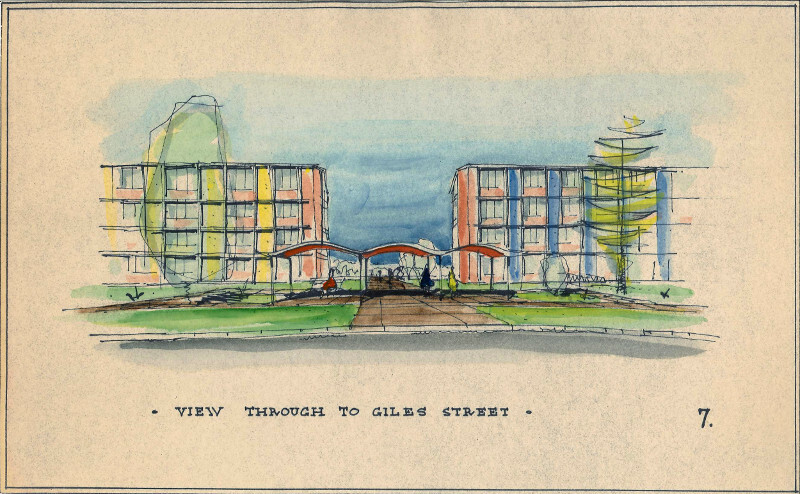 In February 1951, while discussing the aesthetics of the Griffith Section 39 development, Daley recalled comments he made in 1938 about a "more interesting setting as seen from Giles Street." These included plantings up the slope past the flats, by way of a wall and steps, to reach the higher ground. He proposed the top aspect to be reserved as a lookout park. The NCPDC noticed that in plan TP52/50, this walkway now "lined up with the Hotel Kingston footpath, and not with the centre of Giles Street, thus defeating the project previously envisaged." The plan also shows what was to be "a look-out park" reserved for a future YWCA Hostel. Senior Town Planner, T.R. Gibson wrote, "the site is elevated and will provide a terminal more suitable than leaving the ground as open space ad infinitum." His feeling was there already were other prominent lookouts where "an infinitely greater panoramic view can be obtained." In June 1951, the NCDPC proposed design concepts for two types of flat blocks. One consisting of three blocks, each of five or six storeys in height, with each block comprising 16 one-bedroom and eight two-bedroom flats. The other to be of six blocks, each of two storeys in height, with each block comprising four three-bedroom flats. Both sets of flats in total were to provide an estimated accommodation for 264 persons. The flats were to incorporate all the modern amenities of the day including, "garages, pram shelters, laundry facilities and central heating and hot-water system." The NCPDC concluded that the, "construction and finish should be to a harmonious design for a co-ordinated group in the whole section" so as to provide "...a dignified architectural grouping in Section 39." In February 1952, the Department of Works amended Griffith Section 39 due to the realignment of Light Street. This in turn resulted in alteration in the siting of the flats due to the blocks "cross fall" adjacent to Light Street. 2014 aerial view of Griffith Sections 39 and 43 showing the realigned Light Street. In July 1957, the Department of Works forwarded their 'Five Year Programme' notes on the flats to the NCPDC for comment. These notes included changes to the number and size of flats required, stating "Accommodation is to be about 80% two bedroom flats and about 20% bed sitters. No three bedroom flats are wanted on this site." 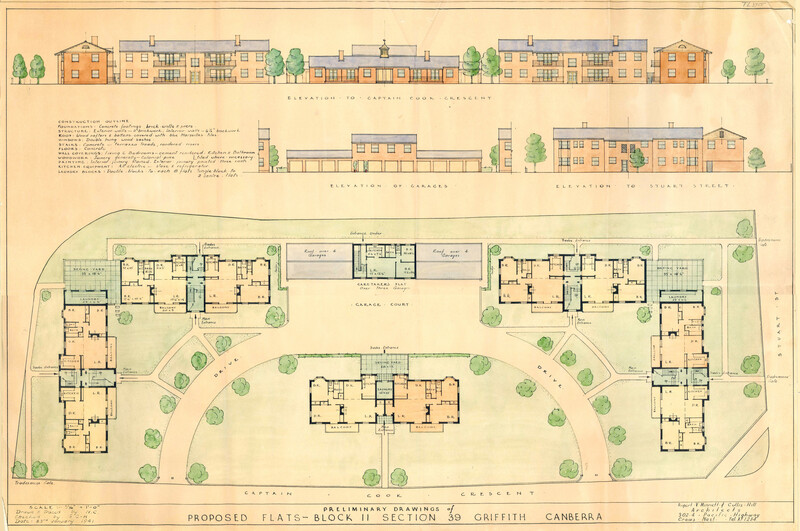 The Department of Works then commissioned architects Spencer, Hanson & Partners to produce a 'Report on Design and Planning of Flats Project No.19, Section 39, Griffith, ACT' . The report covers the construction of 101 two-bedroom flats, 18 two-bedroom maisonettes and 29 bed-sitting room flats. It also includes photos of the architects' model and coloured site sketches that closely match the finished flats in layout, if not appearance. The architects' vision for Stuart Flats featured a somewhat more modern finish than the completed flats. Photo of the architects model of the flats for Griffith Section 39. The studio of prominent Australian photographers, Max Dupain and Kerry Dundas, produced the photo. 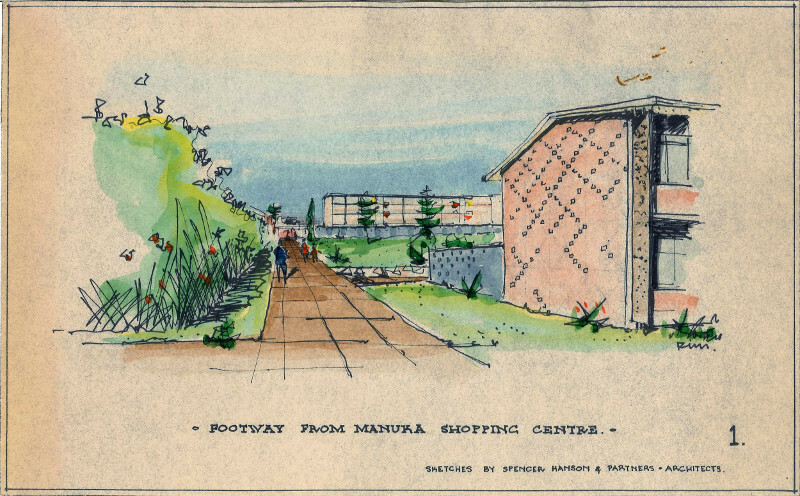 1957 sketch of footpath from Manuka Shopping Centre & same view in 2015. On the 20th of February 1959, the Minister for the Interior, Gordon Freeth, announced the letting of the £639,888 contract for construction of the flats. The Canberra Times reported, "The successful contractor is Karl Schreiner Pty. Ltd. Target date for completion is 18 months from commencement of building operations." 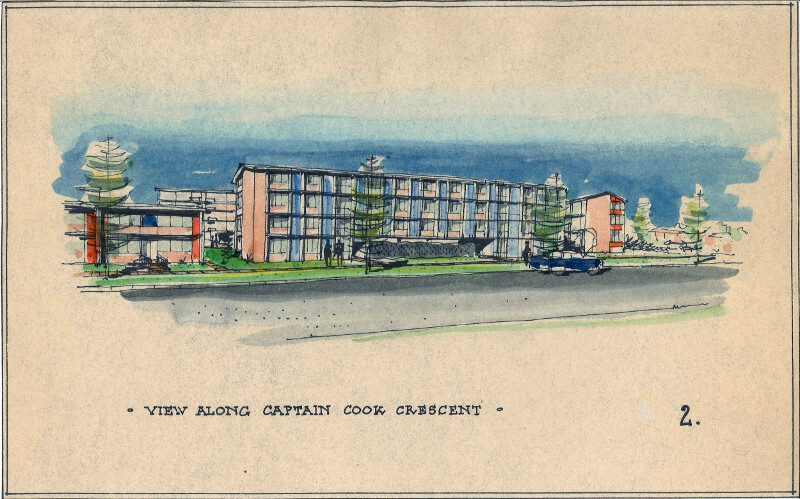 1957 sketch of view along Captain Cook Crescent & same view in 2015. 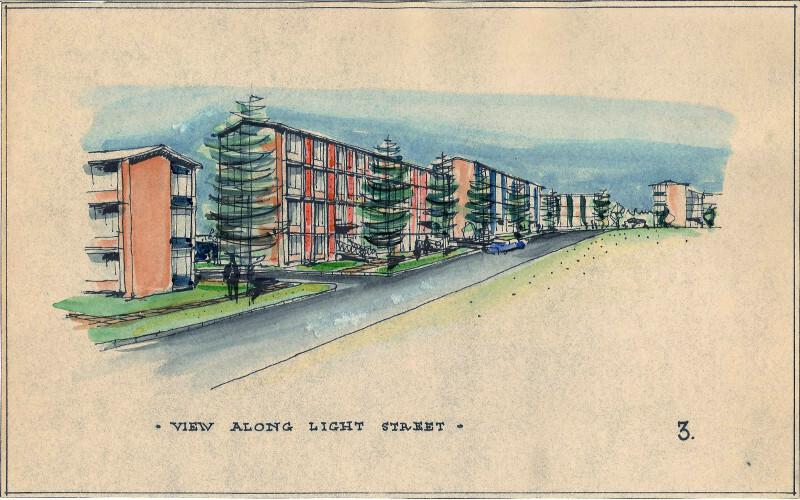 1957 sketch of view along Light Street & same view in 2015. "Frequently, when completed buildings were viewed in their surroundings the appearance was somewhat different from the design on the drawing board." Freeth continued, "...the architects themselves had felt in the course of construction that the appearance would need enlivening." 1957 sketch of view through to Giles Street & same view in 2015. 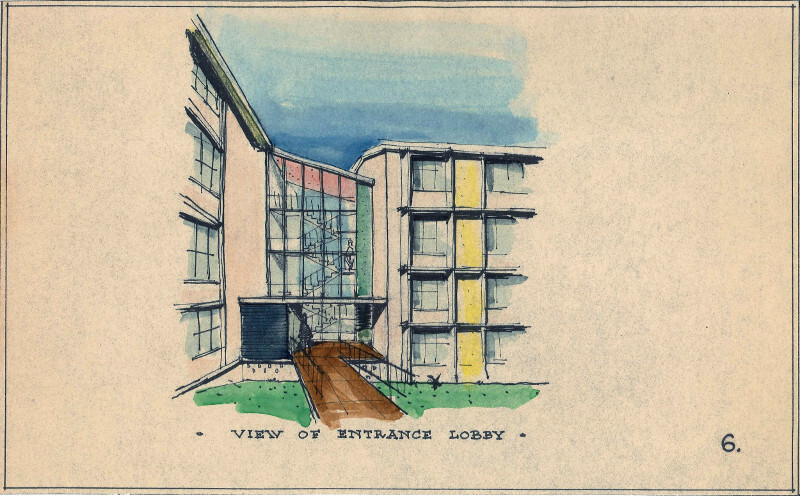 1957 sketch view of entrance lobby & same view in 2015. The painted sections of Stuart Flats have undergone a number of colour changes over the years. Prior to the current "buff colour", these sections were a similar shade of yellow to that shown in this sketch. The mid 1950s was a time for rapid urban growth in Canberra. The Stuart Flats were one part of this expansion in accommodating the influx of Public Servants. 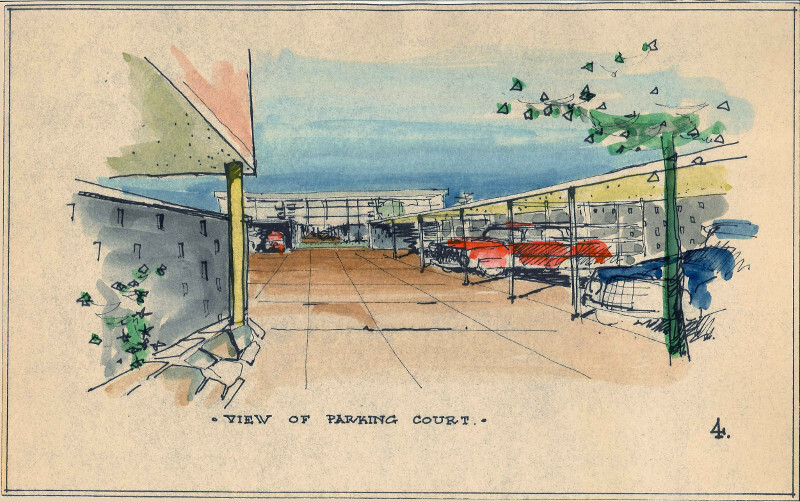 Sketch view of parking court at Griffith Section 39.